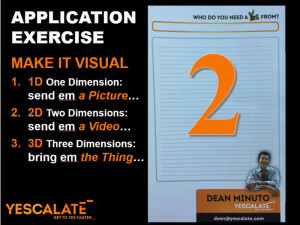 Summarize all of the above with videos for your review following the Workshop. So that you and your Team can GET TO YES FASTER®. “to see, to perceive, to understand“. Remember the brain’s job is to keep you alive. our most important sense for survival is sight. stimuli presented by the eyes. through the eyes than through the ears. How can you make your message more visual? in the First Quarter? Register them today.